There are quite a few different "Tip-up" and "Hook-set" set ups for ice fishing these days. One comment I recently saw someone make on a discussion board about legalizing the use of devices in Minnesota such as the JawJacker was this, "Don't we have enough electronics already? Does someone really need more to catch fish? Remember, it's fishing not catching!!! If they do pass it I wont use it but if someone wants to then fine but I would say no." - Doug. My post is not to necessarily argue with Doug making this comment but rather point out some misconceptions that many people (such as Doug) may have and give some reasoning and benefits of using the JawJacker. Well the JawJacker, along with all of the other devices of this kind, are not electronic at all. It is unfortunate that those who are "against" using these devices are under the misconception that the devices are electronic and some how give the fisherman an some unfair advantage by being electronic. 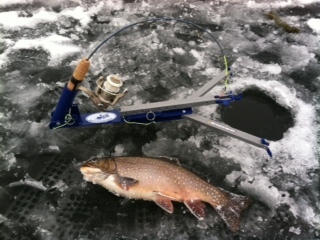 The truth is that the JawJacker is a device that is powered solely by the ice fishing rod that you put in it. Even though there may be a spring on the trigger adjustment of the JawJacker to adjust the tension of the trigger mechanism, the spring does absolutely nothing other than adjust how sensitive the device is set. There is no spring loading in the way the device sets the hook or in the way the device is held in the ready position. The JawJacker relies primarily on the tension of the rod itself to set the hook which can be adjusted to match the fish you are attempting to catch. The angle of the rod in the rod holder as well as the length of the trigger arm will fluctuate the momentum of the rod from an extremely light hook set to a harder hook set for bigger fish. To demonstrate how these devices work please watch the video provided by Matt from JawJacker! Misconception #3 "Fishing not Catching"
One thing I am a huge believer in is that this device does EXACTLY what it says it will do! I have never used a product in fishing that is more spot on with what it promises to its consumer! The JawJacker website state, "The JawJacker is a new ice fishing device that is designed to help ice fishermen catch more fish. When a fish bites, the trigger releases the bent fishing rod so it can snap up and set the hook. The trigger is very sensitive and can detect light bites." There is also a slogan that JawJacker stands by which says that this device "Makes good ice-fisherman better" which is exactly what this product does. It is important to point out that this device is not 100% guaranteed that you will catch a fish. There are times that this device is set off while missing the fish, why it's still called fishing not catching! There are lots of tips to up your hook-up percentage with the JawJacker but even with these tips nothing is 100%. So this device does not make ice fishing into fish-catching. It is also obvious that you need to be where the fish are to catch fish as well as use the bait the fish are biting on. The misconception that the Jawjacker will take the sport out of it is simply just not true. Lastly I just want to say that no one I have visited with, chatted to, or tried to convince about the JawJacker has really been completely 100% sold on it until they have seen them in action (either in person or on YouTube)! I have been ice fishing numerous times this year where I have had people come over to our group to see "what we were doing different" or "what all the excitement was about". The answer to their question is quickly given to them as they watch the JawJacker in action! Check out how much fun this kid has catching fish on the JawJacker! As many times as I have been out ice fishing I still get the rush when the JawJacker goes off, but nothing to me is as exciting or fulfilling as when I take a few "first timers" or a few kids up ice fishing with the JawJacker! Watching kids run from pole to pole as they go off with a school of hungry fish swimming through is irreplaceable! As I said earlier that the biggest selling point is watching these in action so I want to not only show you a video of the JawJacker in action but also a way to get entered to win yourself a JawJacker!!! That's right, here is your post-Christmas present from JawJacker! To get entered just follow the instructions on the Rafflecopter below and be sure to share the word so that we know you like what we are doing! Good Luck! In the picture above you can see the fly hooked onto the end of my ice fishing rod. I have always used bigger jigs than some of the typical ice flies so this one was pushing it for me being a #12. The bead on the head of this ice fly is tungsten (3.5 mm) which made it nice for sinking it down to where the fish are. The slab spike was the most popular with the fish on the day I used them and seemed to be what the fish were after. The day I used them was actually a very slow fishing day and no one around us was getting any bites let alone catching fish. I caught a few fish on the slab spike jigging while I also caught a few letting it sit and the fish would still grab it on their way by. Now for my personal favorite.... Ice Fly #2!!!!!! This little guy was also pretty popular with the fish. I ended up tying this guy on about a 12 inches above my "go to" bait that has been my most productive jig. The interesting thing is that there were a few fish who snagged up both baits while looking for some food but by the end of the day I ended up catching more off the Gill Shrimp than I did my bottom jig which in the past was always the #1 producer. The Gill Shrimp is a #14 which was very small for me to use but the design of it was irresistible to the trout throughout the day. If you click on the nave of the fly in my post it will take you to a link where you can check out the prices of these flies as well as the different sizes you can order. Be sure to check out 3 Brother's Flies for more of their products which is way more the ice flies! Thanks again for the opportunity to review the flies! 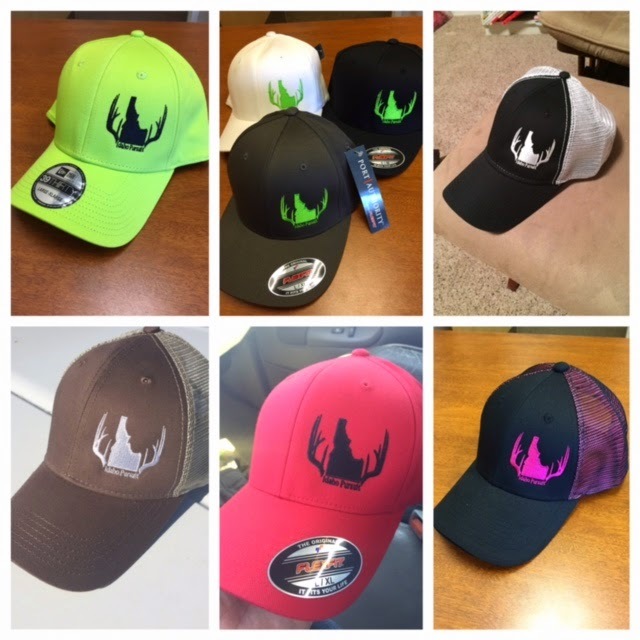 Needing a simple gift idea for the outdoors enthusiast on your Christmas list? I would strongly recommend Geigerrig’s Tube Garage! Straight up, this $30 dollar purchase will be one of those gifts they never thought to put on their list, yet find themselves using it more than any other gift they receive all year! Let me explain why. I will first explain how the Tube Garage works and then I will share with you the benefits and reasoning why this product will be one your outdoors person will use constantly. This product is made by Geigerrig, which that in itself packs a reputation for going above and beyond the normal backpacking experience. One thing I like about the Tube Garage is that it is compatible with any hydration pack you may have. The Tube Garage is pretty much exactly what it sounds like… This contraption straps onto your backpack shoulder strap and encloses the hydration hose/tube in an insulated compartment. The Tube Garage attaches by two Velcro straps which prevent it from sliding around on your shoulder strap during use. The tube garage is also equipped with a side zipper to allow you to access your hydration tube whenever necessary by simply grabbing the zipper and opening the garage. Now, the benefits of using the Tube Garage! 2nd – Another benefit from using the Tube Garage is allowing yourself to forget about tubes and hoses! No matter how many clips or loops my pack has on it to keep my hydration tube out of my face or out of the way of me doing other tasks, my hoses seem to have a mind of their own and always seem to get in the way! With the Tube Garage your hose will always be secure tightly in the enclosed compartment unless you open it up and let it out. This is a HUGE benefit for those who use hydration packs when hunting, especially archery hunting. I myself have almost damaged my bow and my hydration pack because my hydration hose has gotten tangled up in my bow string while at full draw. I would strongly suggest that anyone who archery hunts or anyone who enjoys the sport of archery shooting should get the Tube Garage. 3rd – The last benefit I will mention about the Tube Garage is its durability! The TubeGarage provides your hydration tubes with an insulated housing that protects it from the cold and elements you surround yourself with while doing so is a durable and compact fashion. This product actually allows you more freedom, movement, and safety than any other simple $30 purchase I have seen. Inside the Tube Garage there is also an internal pocket you can use to place a hand warmer in to use when in extremely cold conditions. So no matter what pack, hydration system, terrain, and activity you will encounter, I can see the Tube Garage being one of your most simple yet rewarding items to have for yourself or for that outdoors person on your Christmas list! I used the Tube Garage in -16 degree weather without using a hand warmer (just because I forgot it at my house) to keep the tube warm/above freezing… I wish I could say that the Tube Garage was awesome enough to fight off the -16 degrees plus wind chill when keeping my tube above freezing but it is not the superman of insulated compartments. In this type of weather without the assistance of the hand warmer it was a no-brainer that my hydration tubes ended up freezing. I did use the Tube Garage again during another ice fishing trip when the temperature was a whopping +18 degrees. This trip I still didn't use the hand warmer and my hydration tubes stayed nice and free all day long without freezing or even icing up a little. I strongly recommend this product as well as anything else Geigerrig makes. I have not been anything but impressed with the quality and durability of all of their products I own. As with all reviews on Idaho Pursuit, the following review is my honest opinion. I am not a pro-staff member of, sponsored by, or associated with Geigerrig and am not accepting any compensation, monetary or otherwise, in exchange for this review. My independent status may change in the future but, as of the date of publication, no relationship other than described above has been pursued or established.